Great weather brings forth great food festivals where best cuisine from all over the city is gathered in one place. So how to manage the eating in such a place where everything is bound to taste great? Well, let us pen down some tips that can help you with this dilemma. You know you are not going to be eating your greens at the food fest, then start your day by eating healthy. Have a small mid-day meal like salad, or nuts and seeds so there is some balance in your diet. You know you won’t have the dinner right, then at least have the lunch right. Don’t think that you would have more room if you skip a meal. All it’s going to do is make your mood crabby and bring your energy down. As a matter of fact it will spoil your mood for the festival. Instead, take a light meal that will balance your blood sugar level so you don’t feel lethargic or down at the festival. 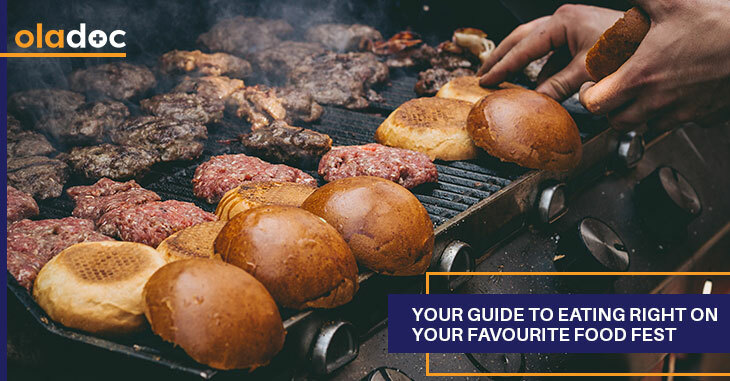 Yes, we know that it is tempting to gorge on the one favourite meal that you see right off the bat at the food festival, but it is important to pace out and take small amounts of food. Not only will it be more enjoyable for you, but it will also allow you to sample number of stalls before you have to stop. Spread your meal on the plate if you have to, to trick your brain into thinking you’re eating more, but do not have a full stomach before sampling the best stalls. Before you buy, take a look around the whole place and select the food items that you want to sample. Bookmark your favourite ones so that you don’t miss anything you wanted. It will also help if you don’t keep lingering around your stall so that you don’t keep reordering a favourite snack. Order, take your food and move away if you want to try other stalls. Once you have ordered, make sure to share your food with your friends. Not only will it save up room in your stomach (for more food), it will also allow you to sample variety in lesser time. You can thus check more stalls this way than if you individually went to each stall. Avoiding fried food is a great way to make room in your stomach. Foods that are rich in cheese or heavy sauces is likely to fill you faster. If you like a fried food item that you like, maybe save it for the last after you have tried everything you wanted. It goes without saying that you have to try the dessert. But don’t make yourself uncomfortably full with dessert after all the savoury items. Split the dessert so that you end your evening on a great, sweet note. If you would like to know more about a healthy lifestyle and healthy foods that you must eat, consult a professional who can help you make the right choices. Book an appointment with top nutritionist in Lahore, Karachi and Islamabad through oladoc.com, or call our helpline at 042-3890-0939 for assistance to find the RIGHT professional for your health concerns.